1. Filing U.S. expat tax return: what are the 2018 tax deadlines for U.S. expats? 2. What documents and information are needed to file my U.S. expat tax return? 3. I want to file for an extension, how do I do it? 4. Can I file tax return on my own or do I need a U.S. tax specialist? 5. Which forms should I know about to start my tax filing process? 6. Will I get notified if IRS have received and processed my documents? 1. 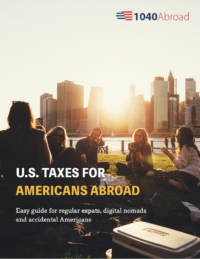 Filing U.S. expat tax return: what are the 2019 tax deadlines for U.S. expats? You have 4 important deadlines to remember if you are filing U.S. expat tax return as an American or dual citizen living overseas. As a U.S. person in the U.S. who files their tax returns on a calendar year basis, the due date is April 15 of the following year (April 15th, 2019). But if you file on a fiscal year basis, meaning a year ending on the last day of any month, except for December, then the due date is 3 months and 15 days after the close of your fiscal year. Rule to remember: you will need to pay your tax by the due date of the return. The extensions of time for filing your return don’t apply to the time that is given to pay taxes. October 15, 2019 – Final federal tax return and FBAR deadline with an automatic six-month extension. As a U.S. expat abroad, you will automatically qualify for a two-month filing extension. That’s why your return is due by June 17, 2019. But the date to pay your taxes is April 15, 2019, even if you are an expat. If you fail to pay your taxes on time, there will be interest charged on the unpaid amount. U.S. taxpayers can receive an additional extension until October 15, 2019, if they aren’t quite ready to file your FBAR by the April or June deadlines. You can request the additional four-month extension by filing form 4868 (via paper or electronically) by the due date of the return. Note, that this is not an extension to pay the taxes due. As a reminder, you must file an FBAR if you’re a U.S. citizen with overseas financial accounts that total more than $10,000 at any point during the year. The FBAR filing deadline is no longer June 30. Starting in 2017, it now coincides with the U.S. tax deadline of April 15, but an automatic six-month extension is available. Basic information includes the tax questionnaire, prior year tax returns, and a travel journal. A tax questionnaire is a form that your tax preparer will provide you with to complete. It asks you basic identifying information, as well as details about living and working conditions. You will need to fill out this form carefully as your tax preparer will assess your situation based on this information, and choose the best tax treatment to maximize your wealth while also minimizing your tax burden. The prior year tax return will help you to file your return for this year, as it already provides some of the important available information. For example, if you want to use the Foreign Tax Credit, then you need to know that it’s crucial to correctly carry it forward. It’s also important to check your returns from previous years for any mistakes that could be fixed now so that you will escape possible negative consequences or penalties etc. If you have visited the United States, then include the exact number of business days you spent there and the exact amount of gross income earned in the U.S.
Wages, salaries, and compensation. It’s necessary that you provide all W-2, P60, P45 and any other wage reporting forms. If you are a self-employed U.S. person abroad, then you will need to give your tax specialist precise and detailed records of your earnings before deductions and total expenses, which should be grouped. Interest and dividend income. If you deposited money into a (foreign) bank or other financial institution, and they pay you interest, then this will be classified as interest income. Dividend income refers to any distribution of a company’s earnings to shareholders from stocks or mutual funds you own. Foreign banks usually do not have reporting forms that show the amount of income that is paid to you. That’s why it’s essential to keep your bank statements and reports of income from your foreign bank, even if this type of income is not taxable in your tax home country. American banks, on the other hand, provide you with year-end reporting forms and you will receive the 1099 forms. Securities and stocks. If you own investments in any country, including the U.S., then you will need to report this on your tax return the capital gains and losses during the year. Your broker will send you a statement with accurate information regarding each of the transactions and you will need to make sure it has the purchase/sale price, transaction fee, and purchase/sale date. You may want to let your foreign broker know that this income is taxable in the U.S. Therefore, you will need all of this information. Real estate. Any real estate bought and sold is pertinent to your tax return. Make sure that you have following information: date of sale/purchase, the purpose of property, total costs, and proceeds, any improvements made etc. If you own a rental property, then you will also need to provide your income and your expenses during the year, which will be reported separately on Schedule E.
Distributions, including pensions, annuities, profit sharing plans and IRA. The U.S. government will send you an SSA 1099 form if you receive Social Security payments from the US. If you have payments coming from a foreign social security and/or pension and do not have an end of year statement, you will have to keep track of the payments and report them as income. Another type of income. You will need to report any partnership, trust, and business interest that you hold, as well as all other types of income that have not been mentioned. If you are a partner in a partnership or a shareholder of a corporation, your foreign partnership or corporation will provide you with an end of year statement that reports the income and expenses allocated to you. If you are a partner in the U.S. partnership or an S corporation, then you will receive a form Schedule K-1. Deduction documents will help to reduce your taxable income. These include interest and taxes paid, foreign housing expenses, dependents and a few other deductions. Interest and taxes paid. Under the expat tax laws, mortgage interest, property taxes paid and income taxes paid are all deductible expenses. You must be able to prove that these payments were paid or accrued. Keep track of your bank account statements, transactions made directly to the governing agency etc. You can avoid double taxation on your income taxes if you live in a country that assesses income tax on your income. Foreign housing expenses. You may be able to deduct the cost of your housing as a U.S. expat abroad. Ask your tax preparer whether you qualify. Dependents. You must provide information, such as SSN or ITIN if it is applicable for all of your dependents. Your tax preparer will help you to claim the available deductions and credits if qualified. Other deductions. Did you know that gifts to family members and charitable contributions to a qualified charity can lower your taxable income? Alimony and child support payments, as well as unreimbursed business expenses, are deductible expenses. They are subject to limitations, but can still significantly lessen your tax burden. Keep track of all your expenses and pass them on to your tax preparer, who will help you to lower your taxable income. Foreign Bank Accounts are a big chunk of your tax return. If the aggregated value of your foreign bank accounts exceeds, or is equal to $10,000, on any given day during the year, then you must report this amount to the IRS. Are you ready to start your tax return with 1040 Abroad? Let us do what we do best: taking care of your tax returns while you enjoy your U.S. expat life abroad. If you are an American citizen or a U.S. person abroad, then you can get an extension of time to file your return. There are few options available for you as a U.S. expat but you need to remember that you still must pay the tax due on the regular due date, otherwise, there will be interest charged until the date the tax is paid. An automatic two-month extension is available by default to U.S. citizens or resident aliens who live outside of the United States (including situations when you are in military or naval service overseas). They have two more months to file the tax return, but the federal income tax must be paid on the regular due date of your return. Otherwise, the interest charge is assessed. The regular due date of your return for the tax year 2018 is April 17th, 2019 and a two-month extension will allow you to extend the due date to file your return to June 17th, 2019. All you need to do is attach a statement to your tax return explaining that you qualify for this extension as a U.S. person abroad. If you are a married couple filing a joint return, then either you or your spouse can qualify for an automatic extension. However, if you file separately, this extension applies only to the one who qualifies for it. Another automatic six-month extension allows you to have more time to file your return if you can’t complete it by the regular due date. Again, it doesn’t apply to the time to pay your taxes. To get this extension, you need to file a Form 4868 and show your properly estimated tax liability based on information available to you. You want the IRS to figure out your tax. You are under a court order to file by the regular due date. You must estimate your tax liability for the year and pay it by the regular due date. Otherwise, there will be interest owed on any unpaid amount from the original due date of your return. You may also face a penalty for paying your taxes late (unless you have a reasonable cause). Penalties are assessed from the original due date of your return. If you qualify for an automatic two-month extension, the penalties will be assessed from the extended due date of the payment (June 15 for the calendar year taxpayers). The IRS has another discretionary two-month additional extension of time to file your return (to December 15th for the calendar year taxpayers who live abroad). To request it, you must send a letter to the IRS by October 15 explaining the reasons why you need the extra two months. You will be notified only in case of denial. It is not available for those taxpayers who have an approved extension on Form 2350. To obtain this extension, you must file Form 2350. If you failed to meet either the bona fide residence test or the physical presence test, you will need to file your income tax return as soon as possible as there is interest charged on any tax due after the regular date, even though you had an extension. 4. Can I file a tax return on my own or do I need a U.S. tax specialist? The United States is only one of two countries in the world whose taxes are based on citizenship. If you are a U.S. person abroad, there is a whole different system of requirements, tax laws, deductions, credits and exceptions available. You may not benefit or utilize most of them if you decide to prepare taxes on your own. Hiring a U.S. tax preparer will save you time, nerves and money. They will minimize your tax burden or even gets you a refund if you qualify, while you can focus on your income producing activities. The introduction of FATCA (The Foreign Account Tax Compliance Act) in 2010 changed the game for a lot of Americans abroad. Expats who prepare their own returns have to figure out the best strategy to minimize their U.S. tax liability on their own. It is not impossible! In fact, it’s really fun if you are a tax geek like us. However, it can be a complex, time-consuming task without any guarantee that knowledge and experience will produce the most beneficial outcome. You may want to do your own taxes when you have a really simple return, meaning that you do not have any investments, rental properties, own a business or face another complex tax situation. In this case, tax software can walk you through. As they use different kinds of tax return preparation, the software can sometimes lead to different results because of the way the wizards are set up, so if you have a complicated return with a lot of deductions it can pay to try two or more kinds of tax software. If you are self-employed, have a freelance income or own a business, then you may consider hiring a U.S. Tax specialist who will file a return on your behalf and take care of all the available deductions and credits. Hiring an expert costs money, but it will save you even more. Any tax professional with an IRS Preparer Tax Identification Number (PTIN) is authorized to prepare federal tax returns. However, tax professionals have differing levels of skills, education, and expertise. Your CPA back home might not know about all of the available tax treatments for you as they have very little or no experience of working with U.S. international tax law. It makes a big difference when you find a tax expert who will eventually become your personal financial advisor and help you to save more money and make better decisions while being fully tax compliant with U.S. tax laws. 1040 Abroad was founded by a U.S. expat who has been involved in the tax industry for over 10 years both within and outside the US. He particularly specializes in International U.S. Tax Law and shares his true passion through his work. You can contact us anytime for advice and we will be more than happy to help you! 5. What forms do you need to file US expat taxes? Here are some important forms you will most likely have to file as a U.S. person living and working abroad. Form 1040 is the one that all U.S. persons need to file before April 18th, 2017. There is an automatic two-month extension for those who live abroad, which moves the due date to June 15, 2017, and there is a further extension that is available until October 15, 2017. Form 2555 is the form used to claim Foreign Earned Income Exclusion (FEIE). You will need to provide your amount of foreign-earned income, foreign address, employer’s address and the dates you have traveled to the U.S. during the year. Form 1116 is used to claim Foreign Tax Credit. It should be used only by individuals, trusts, and estates. Form 1116 allows you to avoid double taxation by reporting the taxes paid or accrued to a foreign country and offsets them against the U.S. tax liability. You are married and filing jointly: the aggregate value of your specified foreign financial assets have to exceed $400,000 on the last day of the tax year or more than $600,000 at any time during the year. You are either single, married and filing separately, or head of the household: the aggregate value of the specified foreign assets have to exceed $200,000 on the last day of the tax year or more than $300,000 at any time during the year. You will list your bank account information, balances and the income earned from those accounts during the year. Make sure this information matches the amount you have put in Schedule B (interest and dividends). FinCEN 114 is Report of Foreign Bank and Financial Accounts (commonly known as a FBAR). If you have any foreign bank accounts or signature authority over them, and the aggregate value of your foreign financial accounts exceeds $10,000 at any time during the year, then you must file this form. Form 3520 is designed for Annual Return to Report Transactions With Foreign Trusts and Receipt of Certain Foreign Gifts. You need to file this form if you are a U.S. expat who owns the assets of foreign trusts or receives distributions from foreign trusts, and you have received more than $100,000 from a foreign individual/estates or over $15,601 from a foreign corporation. This form requires information from the foreign trust and the taxpayer. Form 5471: If you own at least 10% of a Controlled Foreign Corporation, then you will need to file form 5471 for every year this continues to be true. A Controlled Foreign Corporation is a corporation where more than 50% of the shareholders are U.S. persons. This is an extensive form with multiple pages, and usually, requires the corporation’s financial documents. Filing this form doesn’t mean the corporation is being taxed; it merely discloses the taxpayer’s interest/ownership in the corporation. Any income received from the corporation will be reported elsewhere on your 1040. Form 8621 is designed to disclose Information Return by a Shareholder of a Passive Foreign Investment Company (PFIC), including foreign mutual funds and other investment vehicles. It doesn’t have a minimum threshold and requires information regarding the amount of income or proceeds that have been received from each account each year. This form calculates the tax due on investment income. You will need to remember that income earned from a PFIC account is taxable in the U.S.; therefore, you must file form 8621 for each account. Form 8854 is the Initial and Annual Expatriation Statement, which is used by people who have renounced their U.S. citizenship or ended their long-term resident status, including covered expatriates, to confirm that they are compliant with the U.S. tax system. 6. Will I get notified if the IRS has received and processed my documents? However, you can check the status of a refund from the IRS by clicking this link https://www.irs.gov/refunds.